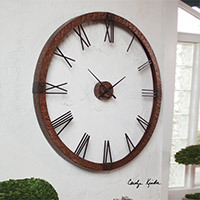 We present a unique range of wall clocks that do much more than just telling time—they exude your personal sense of style, complementing the overall ambiance and accentuating the décor. Unique wall clocks bring some culture to the living space apart from making the empty walls populated with an individual sense of style. All the clocks here are procured from boutique brands that have a tradition of excellence and skilled craftsmanship. All the options here, ranging from the vintage Uttermost 06003 Leonardo Chronograph to contemporary Uttermost 06084 Ronan Wall Clock offers a unique style statement. We implore you to break free from the usual clutter of similarly themed wall clocks and step into our world of designer creations that will transform the empty canvas of your walls in to a visual highlight. Wall Clocks There are 53 products.